KARNEI SHOMRON, West Bank -- The Chicago Cubs are facing the Cleveland Indians in a historic World Series, and most of Israel could not care less. This Jewish settlement is different. These families left behind their lives in the United States to participate in a controversial version of the Israeli dream. But seeing their home teams in Major League Baseball’s deciding series is stirring old American passions. “I think there’s something about baseball more than any other sport that transcends generation to generation," Doug Mandel, who has been waking up in the wee hours of the morning to watch the World Series live from his house in Neve Aliza, told JTA. "There’s nothing more exciting than a walk-off homer in the bottom of the ninth." Neve Aliza was originally part of a separate settlement called Ginot Shomron that was founded by American and Canadian families in 1985. The leafy suburban-looking neighborhood merged into the municipality of Karnei Shomron, located north of Jerusalem in the Samaria region of the West Bank, in 1991. Karnei Shomron, home to about 7,000 Jews, is among about 120 settlements recognized by the Israeli government, in contrast with about 100 unauthorized outposts. But most of the world does not make such distinctions and considers all Israeli settlements illegal under international law. Some 60,000 American Jews live in West Bank settlements, where they account for 15 percent of the settler population, according to a forthcoming book by Oxford University historian Sara Hirschhorn. Even as Americans settlers have become part of Israeli society, they have retained some of their American heritage, she said. "Americans do not abandon their history, culture and values in moving to the occupied territories to create a city on a hilltop, whether that be a baseball mound or a settlement," she told JTA in a nod to her book, "City on a Hilltop: American Jews and the Israeli Settler Movement." For Gold and his wife, that has meant being educators. After leading the local modern Orthodox synagogue, Young Israel, for 15 years, Gold, 60, stepped down this year and is teaching at a local elementary school and providing counseling. His wife, Karen, teaches English at a high school in Kfar Saba. Their children followed a typical path for modern Orthodox Israelis. They went from religious schools to hesder yeshivas, which combine Jewish study with army or national service, and on to university. They are now marrying and having babies. Cubs baseball may be a world apart from his family's life in Israel, but it's part of Gold's personal Jewish history. He grew up going to games, sitting in the bleachers and betting on the outcome of each inning. He has been watching the World Series live at 2 or 3 a.m. when it airs on Israel TV because of the time difference. Since the only TV set is in the bedroom, Karen Gold has been watching, too. “When the screen is 42 inches and blaring in your face and your husband is screaming, you don’t have much choice,” she said, laughing. The children are spared watching the games live. But the sons have to be ready to take part in postgame analysis. 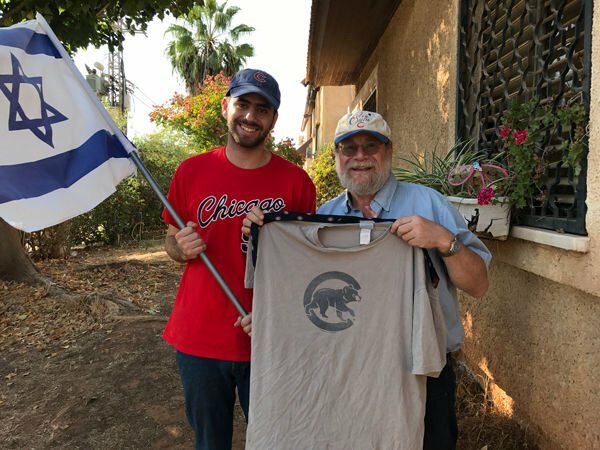 His son, Harel, a 26-year-old electrician who was born in Israel and was wearing a Cubs T-shirt Friday, said he is following the series mostly for his father. “Talking about the Cubs gives us quality bonding time. I support his passion,” Harel Gold said in Israeli-accented English. Asked if he thought Cubs fandom would survive another generation in his family, Harel Gold said he would try to inculcate the sons he expects to one day have with his new fiance. If that failed, he said, they could always bond over soccer. Around the corner from "Chicago Road," Mandel, a 64-year-old retired podiatrist, has been spending nights rooting for the Indians. Fortunately for his wife, Iris, the TV is in the living room. The couple settled in Neve Aliza with their four children in 1993. Three years earlier they had left their spacious house in Cleveland for a trailer in a West Bank immigration center. Iris Mandel, an English teacher who works with Karen Gold, said they were attracted to the neighborhood's tight-knit English-speaking community. “Our attitude was that making aliyah was a huge sacrifice. We left our family. We left our culture. We left everything we knew," she told JTA. "We didn’t have to be 100 percent Israeli, but we were proud our children were 100 percent Israeli. The Mandels' son, Mitch, has been watching the World Series from bed on his smartphone. He is living in his parents’ house with his wife and two sons until his apartment in one of the Karnei Shomron’s new housing developments is finished (over the objections of anti-settlement activists). 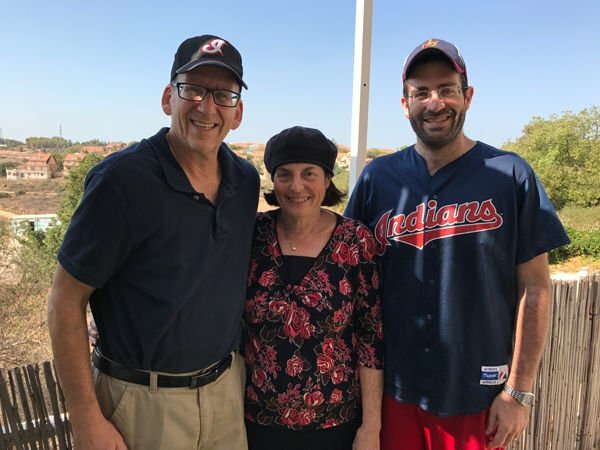 Mandel was 8 when the family made aliyah, by which time a love for Cleveland sports, and the Indians in particular, had already taken hold. In Israel, he grew up playing in the Israel Baseball Association. He anticipates his sons, aged 5 and 2, will one day do the same. A block away, Michael Rich has been recording the World Series games. A 76-year-old retired math professor, he and his wife made aliyah with their four children in 1990. They "fell in love with Israel" during a year they spent in the country while he taught at Ben-Gurion University of the Negev, he said. Neve Aliza, which they moved to in 1997, offered the appealing prospect of helping to start a new community on undeveloped land. Rich said he was not motivated by an ideological desire to settle the "Land of Israel," as settlers refer to the biblical patrimony, but believed the settlements gave Israel more strategic depth. Having grown up selling newspapers and scorecards at Wrigley Field, he never stopped being a Cubs fan, which he said is like being a Zionist, "a bug that gets you." But he did not pass on his obsession to his four children, and his grandchildren and great-grandchildren don't know a balk from a bunt.